Garnier Nutrisse shade 362, “Darkest Berry Burgundy” is a part of our Very Berry collection, specially formulated with cool tones for a vivid, deep burgundy hair color. Dark Berry Burgundy is best for anyone with natural hair between Medium Brown and Black. 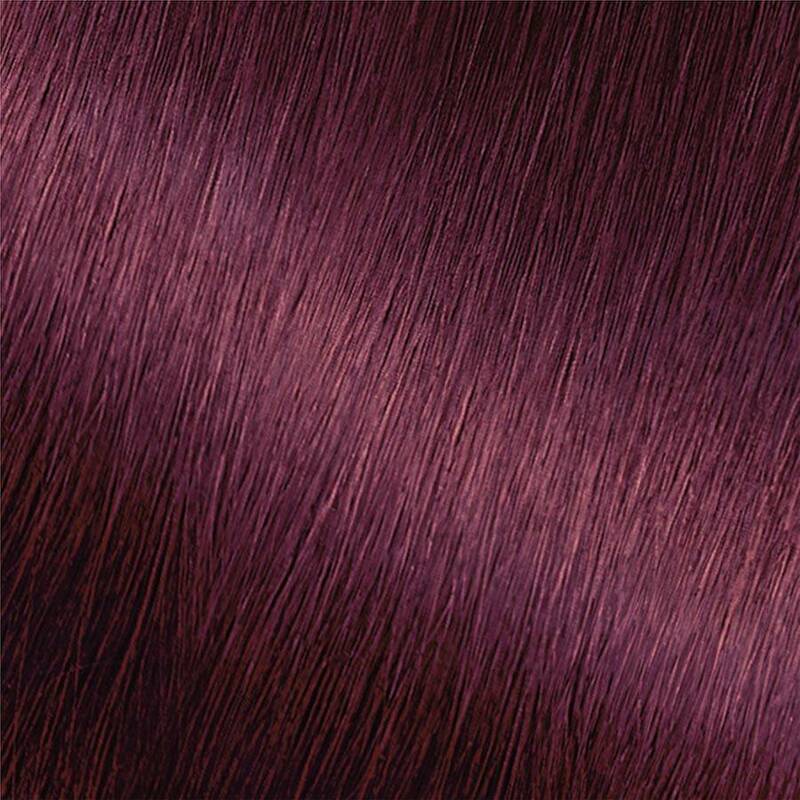 This is the darkest berry shade in our collection. If you would like a lighter burgundy shade, try 462, “Dark Berry Burgundy,” within the collection. For a darker burgundy shade, try BR2, “Ultra Color Dark Intense Burgundy.” If you would like to try other reflects and tones within the Red range, there are many shades to choose from including, Ultra Color BR1 and BR3. Please note that Ultra Color is not designed for 100% gray coverage. *For women with currently color treated hair, there are special considerations for the color result you can achieve. Because of this, we do not recommend shade 362 for hair that has been previously colored shade 30 “Darkest Brown,” or darker. For more help, use our Shade Selector Tool to find the perfect shade for you! Rated 1 out of 5 by Laura78 from DON'T USE THIS PRODUCT I wish I had checked reviews before using! I've dyed my hair black cherry shades many times over the years but never this exact product. My medium/dark brown hair is now black at the ends and purple in general. It has been 4 days now and I've washed 6 times with no change. I guess I'm going to have to go spend $200 to have a professional stylist fix it. I will NEVER buy Garnier again. Rated 3 out of 5 by Rewardedwithwords from Meh I am really disappointed in the after color of my hairI normally go with another product (I don’t remember the name, only the box lol) anyways, the color came out super dark, almost a walnut brown. My hair was light brown with medium tinges of red. Now it’s an unfavorable color. My guess is if you have light hair, use it. If you have medium or dark hair, skip it. Rated 5 out of 5 by Florcita from I am satisfied with this product! :) When I used Raspberry Jam for the first time, I was changing the color from 70- Dark Natural Blonde. I knew that I was taking a risk; I was nervous, but I was willing to try the color. When I completed my color change, I was satisfied. As the color faded, I noticed the blonde coming through even though the burgundy was vibrant still. I use Fructis color care shampoo and conditioners such as Fructis Color Vibrancy Treat 1 Minute Hair Mask to maintain the vibrancy. Recently, I saw a Fructis how-to video. A Fructis hair model demonstrated a color application: a darker tone at the roots and a lighter tone extending down the hair shaft. My bright idea was to try the application with 362-Rasberry Jam and 462 Sugar Beet. Following Fructis' example, I used those tones because I wanted use the closest possible dark and slightly lighter color tones for subtlety and since the blonde began showing after 5 shampoos. Again, I am pleased with the results. I really like using Raspberry Jam, by itself or with a slightly lighter tone extended down the hair shaft for subtle color enhancement. I will stick with the color for a while. Rated 1 out of 5 by Carol G from Disappointed I always buy Garnier. It’s a great product that I would recommend to anyone. I have never had a problem until I wanted to dye my hair burgundy for Christmas. I bought #362 because it showed burgundy on the box. My hair came out BLACK no burgundy at all. The box should show that this product could come out black. I’m an adult and will survive, just disappointed. Rated 1 out of 5 by ellen_z from This might as well be false advertising. 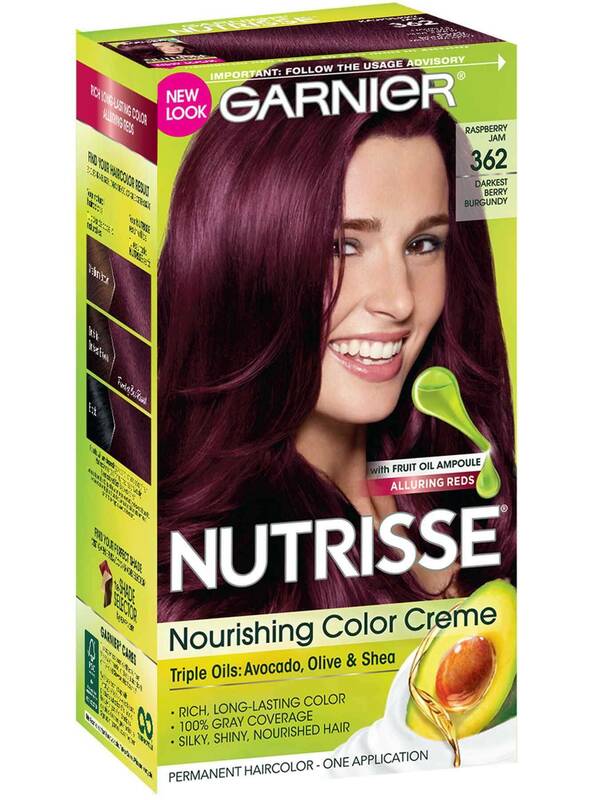 Garnier please consider changing the name of this color . It’s way more of a “blackberry” than the burgandy I was expecting. The photos on this box hardly represent the color you are actually getting. I have medium brown hair and now my hair looks almost black with a very slight reddish/purple hue that’s only noticeable in light. 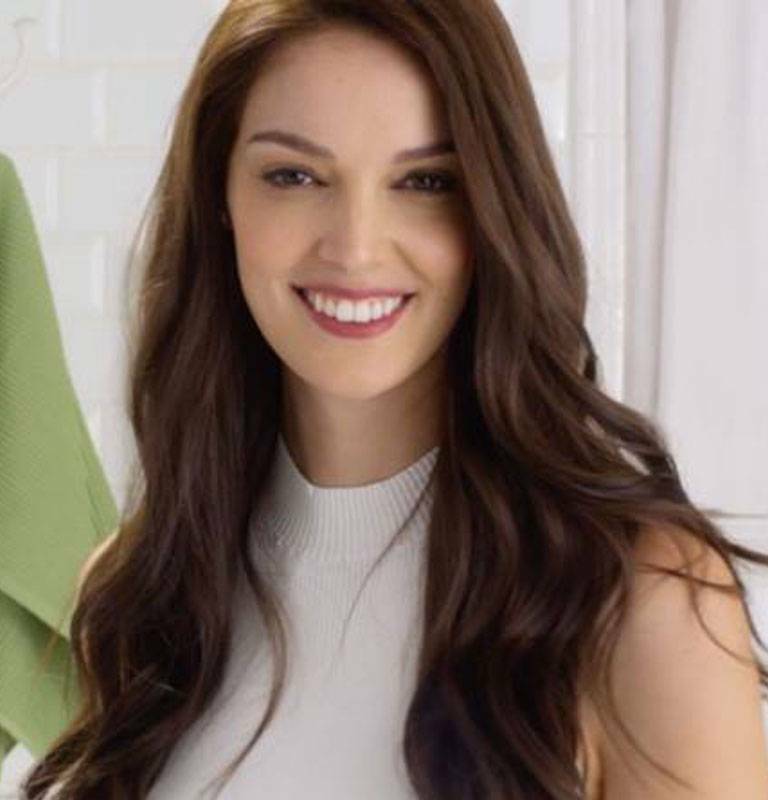 It looks like many other people were surprised by the darkness of this color & Garnier’s response is to keep washing it to help fade the color. If so many people are experiencing the same thing, change the advertising for this color! I’ve had great experience with Garnier colors in the past and now I’ll probably buy your hair dye again. Rated 5 out of 5 by NikolLamar from I adore this color!!! This color is beautiful! It reminds me of the color that used to be black cherry. It looks almost black, but in light there are beautiful highlights of reds and purple's. I've had so many people compliment me on the color and ask where I got my hair done at. Then when I reluctantly tell them it's a box color they are all too excited to find out they can get it too. I see many complaints from people on here saying how dark it made their hair. The name of the color is DARKEST BERRY BURGUNDY. Usually, for future reference, the color it says your hair will be, always count on it being a shade for 2 darker, especially if you already have dark hair. However, as with all dark hair colors after a few week or so of washing you hair, it will begin to lighten up.